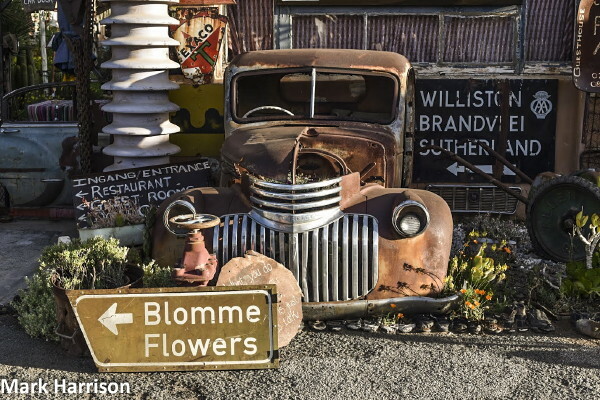 An old Karoo veteran at rest in Calvinia. Calvinia was our oasis. 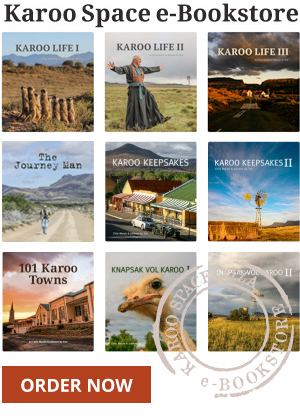 More brilliant advice from Karoo Space. 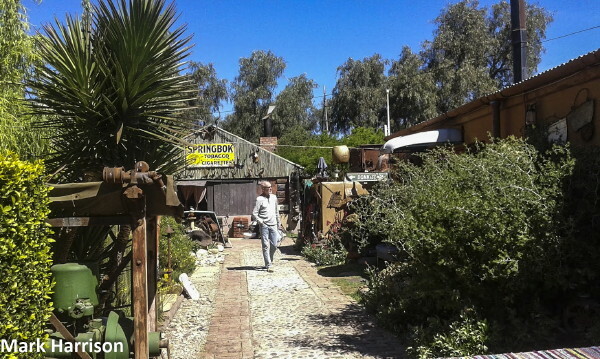 We had rented a snore-resistant three-bedroomed house for four nights from the growing portfolio of the Hantam Huis kompleks. Fed immediately announced that it was the nicest accommodation he’d stayed in, anywhere in the world, and, boy, has he travelled. On Sunday I explored Calvinia while the other two walked in the stately Hantam mountains that surround the town. Welcome to Chez van Rensburg, where the party hardly ever stops! 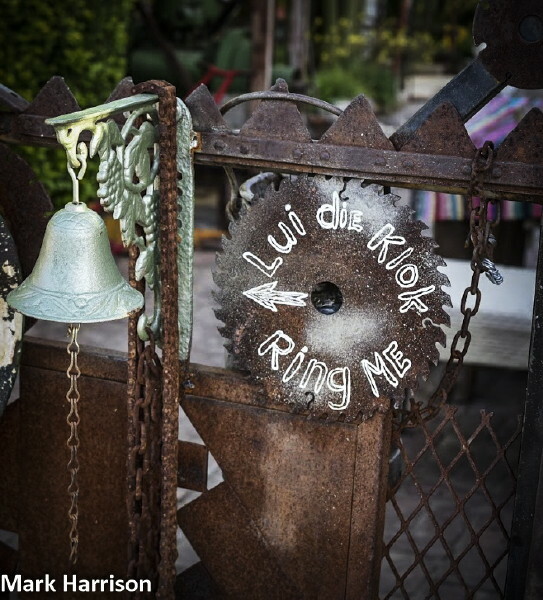 It wasn’t long before I found myself on Calvinia’s “Street of Art” and a few more moments before I was standing in front of a car door that served as the gate to the Republic of RusticA, bearing an instruction to “Lui die Klok”. Before I could yank the rope on the verdigris encrusted bell, an imposing looking woman demanded if she could help. This turned out to be Sonja. I told her I had been advised to visit by Chris Marais. “Are you a friend of Chris’s?” she exclaimed. “Well I’ve never actually met him but he did send me an email,” I replied. Mark Harrison wandering down the avenue at the Republic of RusticA. “Come in,” she demanded. “Hey Dirk, here’s a friend of Chris’s,” she shouted to her other half, who seemed to be the willowy gentleman in a sarong hastily disappearing around the corner. “Have a look down there,” Sonja instructed, indicating a group of sheds at the far end of the site. I obeyed and eventually wandered into what appeared to be a private living area with comfy looking sofas and the remains of lunch on a table at one end. I was just reversing out when Sonja wafted in behind me. She ushered me back in to what turned out to be a kind of gallery, exhibiting her art. 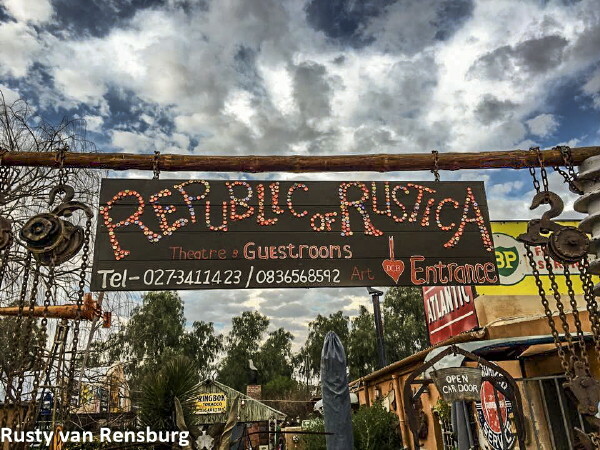 The road trippers stop over in Calvinia. Well, the whole Republic is an art installation and the gallery housed its crowning glory, Sonja’s own paintings and artefacts. Leading off this room was another comfortable sitting room housing an impressive vinyl collection. Dirk collects many things. 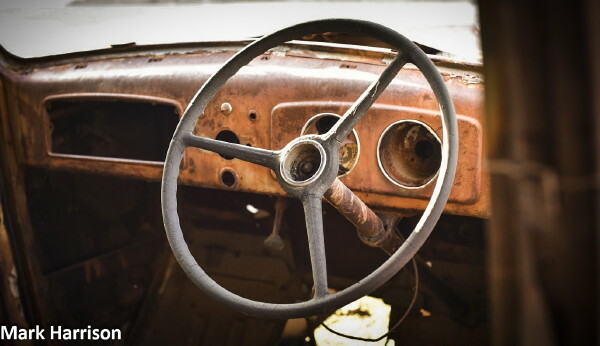 To a lot of people, much of it might appear to be junk but it had become evident to me that everything had its rightful place in the installation. I was hooked. A sign in the yard proclaimed “RESTAURANT, TOILETS, BAR”. 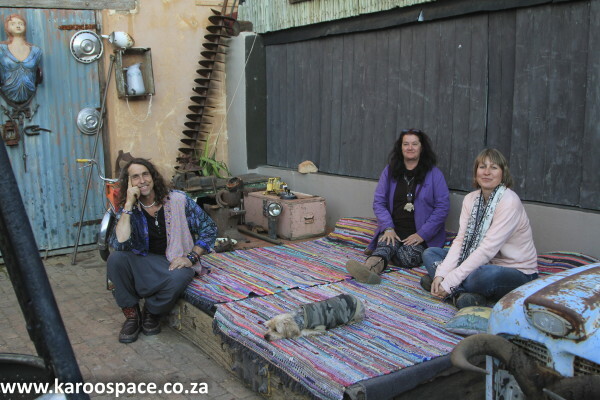 Dirk, Sonja and Karoo Spacer Julienne du Toit. I was determined to return with my mates to partake in this bohemian splendour. I asked Sonja if this might be appropriate. Armed with this slightly ambiguous information I was champing at the bit to get Richard and Fed back there that evening. Nick knacks and metallica galore at the Republic of RusticA. We returned at what seemed like appropriate opening time. There didn’t seem to be anyone about but I led the way to the lounge anyway. Two very friendly ladies were busy extracting the cork from a bottle of red. We assumed it was a house bottle and accepted a glass each. The glasses were of the dimension that meant a bottle didn’t quite go five ways. One of the ladies ended up with half a glass. Anyway, it turns out these two were guests of the self-catering arm of RusticA. The wine was their own personal bottle. They were absolutely magnanimous about us quaffing it, though. They were repeat visitors and seemed confident that Sonja would eventually appear, as would more bottles of wine, together with our host’s personal bottle of whisky. We made appropriate donations in the honesty box. 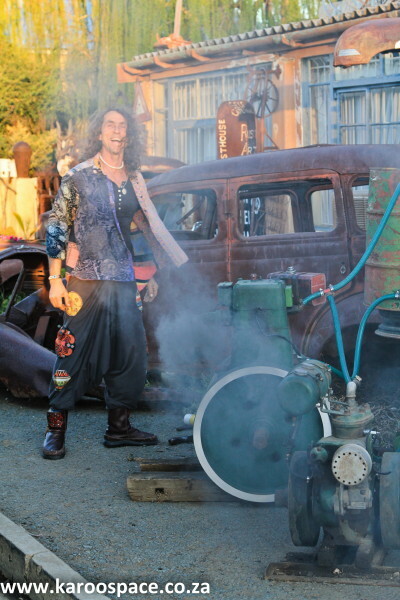 Dirk busy with an old Lister engine on the pavement outside his spot. Lively conversation ensued and we were in full flow by the time the gentleman of the house appeared. “Why don’t you take them to Newtown with you?” she suggested. It turns out the van Rensburgs, a.k.a. Dirk and Sonja, own a bakery. In fact they own several but this one is also on the premises of the Republic. 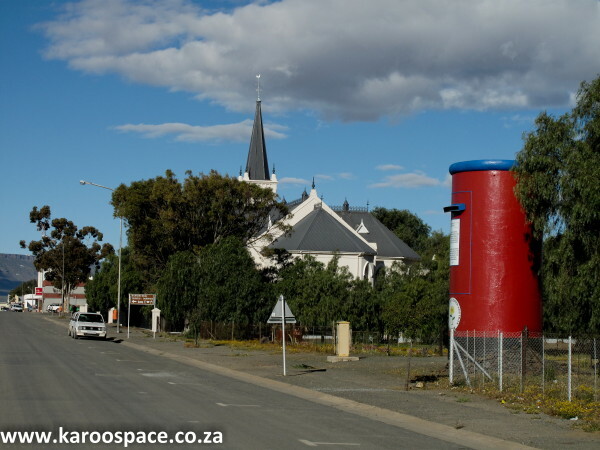 The main drag of Calvinia, where the world’s largest postbox lives. Dirk still had to go out in his van to collect bread crates from the small shops dotted around the Newtown township, which adjoins Calvinia. Fed and I didn’t hesitate. What a positive experience. I’m not saying the people there weren’t poor but there was something not too short of an idyll out there. Children playing free in the streets. Young people dressed to the nines performing what Fed would recognise as a form of passeggiata, a kind of parade with courting not too far from anyone’s mind that is commonly found in Italy, Greece and other Mediterranean countries. Big smiles from all the vendors Dirk visited. Of course, it could have been our host’s positivity that encouraged this as well. Then back to RusticA. After a quick tour of the bakery, it turned out that Sonja was cooking pizza, despite her protestations at having a genuine Italian present. Delicious it was, too. We ate it cross-legged in a comfy area until we were all (a few other participants had appeared by this stage) stuffed and Sonja finally agreed to have some for herself. Back to the lounge for more wine etc. and deep conversation with Dirk. He has a beguiling philosophy. Art and the spiritual goodness of people were core elements. 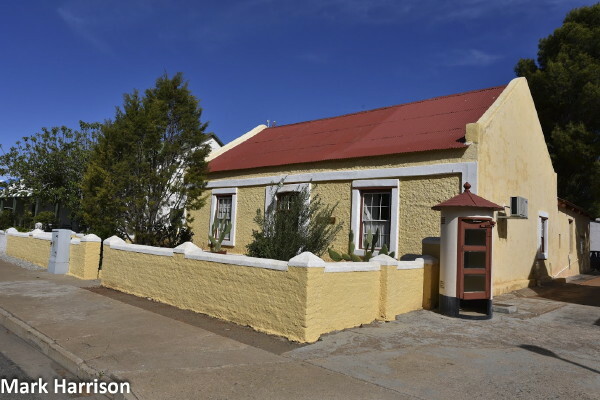 The Boeke Huis in Calvinia, where many writers have come to finish their projects. Richard, who hadn’t had the benefit of an alcohol-free tour of Newtown, was becoming tired and emotional so we decided to repair to our lodgings. Upon inquiring as to what we owed for our hospitality, Sonja gestured towards the honesty box. I am going back to Calvinia. The Republic will be my first port of call. Lovely article Mark, we had a fabulous evening with you guys & every evening in the DCB was a different experience!! From one of the ladies whose wine you quaffed!!! Oh for the time and money to wander these beautiful towns that you write about. Thank you.